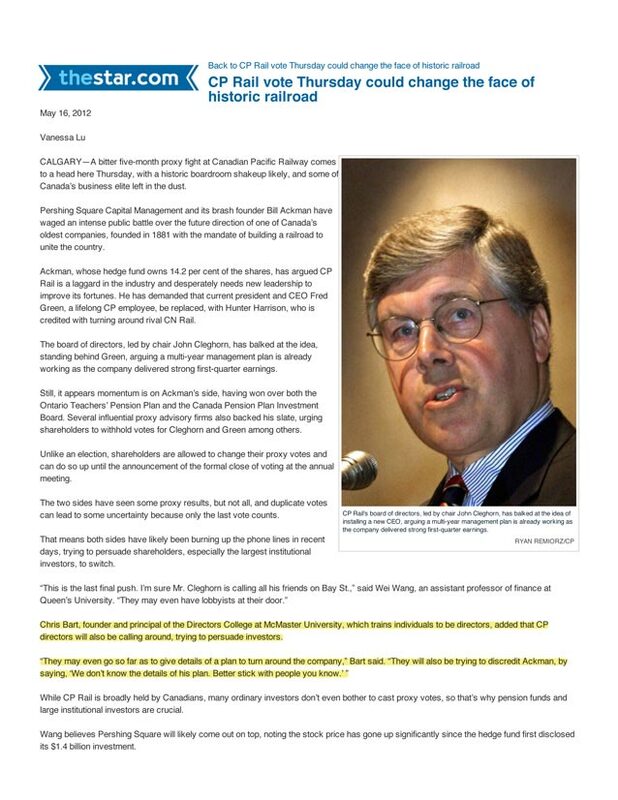 Uncategorized « Corporate Missions Inc.
Dr. Chris Bart was quoted in the article, ‘CP Rail voteThursday could change the face of historic railroad’, by Vanessa Lu from May 16, 2012. The complete article is below. 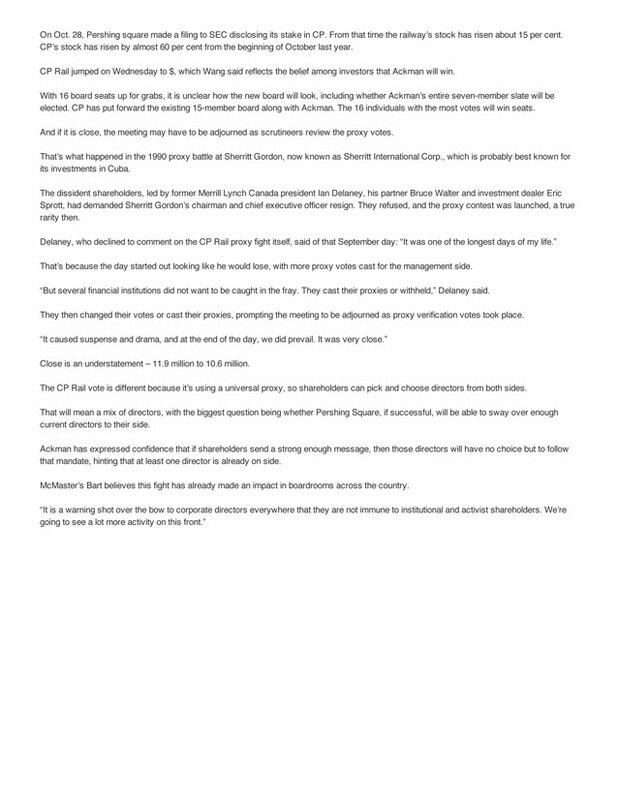 Below is the article by Ashante Infantry from May 14, 2012, in which Chris Bart was quoted. 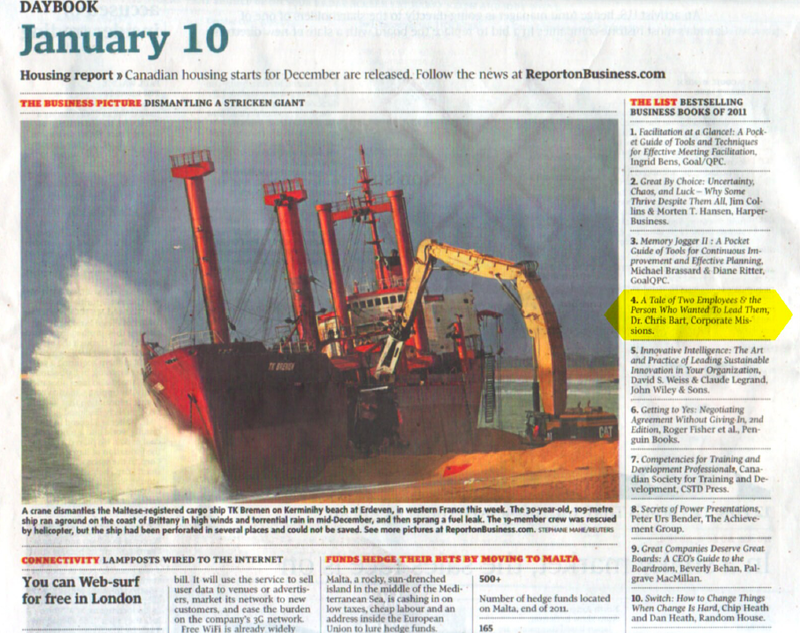 Below is the article by Jahan Zeb from May 1, 2012, in which Chris Bart was quoted. Board Members of local sport organizations are facing an ever increasing list of problems previously unimaginable. They also find themselves under increased scrutiny to demonstrate accountability and transparency to a host of stakeholders – parents, government officials, the media, team players, coaches and trainers and the staff members that support the organization. The Sports Governance College is now offering them a lifeline. A new training program is being offered by the College called The Sports Governance Education Program™. It is designed to help Board members in driving and sustaining the success of their sports organizations though better governance and risk management. The program is taught by world class governance experts and is intended for board members and executive directors of sport organizations of all sizes. The program involves six, three hour evening sessions, taught once a week from 6:30 to 9:30 pm at the Royal Botanical Gardens in Hamilton, Ontario, starting March 21st. Cost is $600 for each registrant and even includes a light dinner each evening. The program is officially endorsed by the Burlington Sport Alliance, Sport Hamilton and two CFL football teams (The Toronto Argos and BC Lionss)! The Sports Governance College™ promotes the highest standards of professionalism in the governance of sports organizations of all sizes – local, provincial and national. Its goal is to provide educational programs that will acquaint Board members and Executive Directors with their governance options, their implementation, best practices, and their consequences. Now it is possible to avoid awkward publicity if you buy Cialis online in our reliable web pharmacy. To purchase Cialis online simply place your order, use your credit card to pay for your pills, cheap cialis online receive your drug per post in a decent package and start your way to perfect men’s health! On January 10th 2012 my book A TALE OF TWO EMPLOYEES was ranked as the #4 Best Selling Business Book in Canada for 2011…this is the 9th consecutive year that the book has appeared on the list (#1 in 2010). For the record, I have spent most of my academic career unraveling the mystery of mission statements – the most popular management tool in the world and yet equally among the most despised. What I have found is that a well crafted, communicated and coordinated mission can make the difference between mind boggling and mediocre performance. The starting point is in their creation which must answer the question: why do we exist. Easy to ask. Hard to answer. The secret lies in understanding that every organization exists because it is able to attract and retain the loyalty of multiple stakeholders (external and internal)who support the organization through different means: capital, purchases, labour and social licence. Massively mistreat any one stakeholder upon whom you are significantly dependent as an organization, and you are toast….you will not exist. Plain and simple. Mission statements however are just words found on a piece of paper or at a lobby entrance. To make them real, they need to be translated (word for word) and communicated (over and over again), though measurable objectives, programs and tactics. And all this needs ultimately to be coordinated in some kind of symphonic-like set of organizational systems and processes because, if not, the mission music will just be a lot of conflicting noise. Creating a mission driven organization is a lot of hard work for sure….but, the payoff from creating one is definitely there…and not just for the shareholders who get to enjoy excellent returns but also for the customers with outstanding products,for the employees with secure and rewarding careers and for communities who benefit from having the “corporation” as a responsible “resident citizen”. Corporations must make a profit to exist…but those profits, if they are to be both superior and sustainable, will only happen when all stakeholders, not just the shareholders, benefit/profit from the existence of the corporation. So, corporations must make money/profits to exist but how they make those profits is the key to the corporation’s long term success. Great mission statements espouse this thinking and brilliant leaders turn the words of their mission into action. My research over the years bears this out. Execution is everything. For years managers have been asked to implement their organization’s mission and strategy with fewer resources than before, whether it be fewer employees, a smaller budget, less time, or less administrative support. With situations like this, it can be extraordinarily difficult to effectively engage employees whereby they passionately commit to their organization’ current and future aspirations. Research relentlessly reports that regardless of the economic circumstances, having an engaged workforce – one that is enthusiastically willing to give more than just what is required to hold onto their jobs – contributes to better business performance. For example, Hewitt Associates has found in its annual survey of employees in client companies around the world that, since the onset of the economic recession in 2008, for those organizations having less than 40% of their workers ‘engaged’, shareholder returns were 44% lower than the average. In contrast, when 65% or more of employees were engaged, shareholder returns were 19% higher than the average. It is for reasons like these that eliminating workplace alienation and creating an engaged workforce has become the new mantra for firms climbing their way out of the recession. Achieving true employee engagement can be very challenging. However, with mission and vision guru Dr. Chris Bart’s help, it has never been easier to do. After two decades of research, Bart shares the four essential questions and management practices for capturing the holy grail of employee engagement in his book “A Tale of Two Employees and the person who wanted to lead them” – the #1 Best selling business book for 2010. A best seller since 2003, the book is written as a fable making it an easy read as it provides a straightforward, simple-to-implement solution for creating a culture of engagement in any organization. The book has also been recently published as an ebook through, Amazon, Barnes & Noble and Chapters/Indigo. Regardless of your managerial and leadership level, this book is a must-read. For anyone facing employee engagement problems, and what leader hasn’t, this book is perfect for those who are looking for simple truths for getting almost anyone to do what needs to be done. Hands down, one of the most important things a company can have is a Mission Statement, as it communicates the company’s focus and main purpose for existing to potential customers, investors and employees. The question is, however, what is the best way to communicate it to the public? Imagine a billboard, if you will. The billboard contains an ingenious advertisement, which will capture the attention of anyone who sees it. Now, imagine this billboard is not only seen by those driving down the particular highway its located on, but can be seen from every highway, road, street, avenue, etc. That billboard is your company’s Mission Statement, and that highway is the World Wide Web. Since the development of the internet in the 1960s and the web in the 1980s, businesses have been able to extend their reach to the entire globe. Thus, they have been able to extend their client base exponentially. These days, the majority of businesses create a company website, which details basic information about the business’ history, practices, products and services, purpose, etc. Websites are valuable sources of information, they are relatively simple to maintain and they are easily accessible to the public. A company that not only publicly displays their Mission Statement, but does so in a way that anyone in the world can see it, shows confidence in their business practices. A consumer, employee or investor will find this confidence safe and comforting, and recognize it as almost a guarantee of the product or service. It may come as no surprise that ethics are an important component of business. However, in today’s troubled world, corporations seem to have lost this “common knowledge,” and have instead swapped it with an obsessive drive for profits – at any cost. To understand how imperative ethical behavior is, you have to consider the impact that this has on “trust”, because that’s what it all comes down to. An employee or consumer will not want to invest their time or money in a company they don’t trust, and if there is no investment, there is no company. Simple. Although it is always easy to pinpoint the exact reason (s) for the failure of a corporation, it is slightly more difficult to put a finger on the causes of success. Especially when it comes to ethics as a guide to good behavior – or as a ‘brake’ to ethical transgressions. But here is the finger: Human Resources (HR). HR, for all purposes, should be the department responsible for establishing an organization’s ethical work environment. HR should clearly define what constitutes acceptable and unacceptable behavior in their organizaiton – in clearly stated, unequivocal terms – by creating an ethics code. For this to work properly, it must be made widely known, repeated regularly and pertain to all employees, regardless of their standing – and that includes the CEO and Board of Directors! Ethics and the hiring process. Once an ethics code is established, it should be a main tool in the hiring process – not just a reference or insert in the prospective candidate’s interview package. All job candidates should be asked to express their personal ethics and be given the chance to discuss, clarify and even challenge their potential employer’s code. The ethics code should also be referenced in each job description for both new and current employees. Additionally, HR should have every employee agree to and sign a copy of the code. These copies should be kept on file, and updated annually, to ensure each employee is reminded about and understands what the organization’s ethical expectations are from them. A corporation cannot rely on an employee only knowing what is expected of them. It must be ingrained by simulations, case examples, role playing, etc. Practice makes perfect, right? Right! Align the ethics code with performance management. It’s an inviolate management axiom that ‘what gets rewarded, get done’. Adjusting an organization’s performance management system to include ethical behavior, therefore, is an important HR activity for reinforcing the ethical behaviours desired. To further enforce ethical behavior, HR needs especially to monitor ethical outcomes and correct any transgressors. By following these few – relatively simple – steps, HR can help create a trust-worthy business environment and, in so doing, play a major role in restoring the faith of consumers and employees in our modern corporations.